If you like to cook, travel, BBQ, philosophize, or seriously lay around, then stop by and visit awhile. On Wednesday we secured the coach and made our one-day-early departure from Lazy Days KOA in Tucson. While we didn’t use the amenities or participate in the activities I still really enjoyed the campground and would definitely stay there again. It is on the SE side of town making it somewhat away from the majority of town with restaurants, etc. Our trip north to Camp Verde took us up I-10, then I-17 around Phoenix and on to our destination. At around noon, we breezed right through Phoenix and other than a few rough patches, found the roads to be in pretty good condition. We pulled into Distant Drums RV Resort mid afternoon, got parked and I went comatose as I now had a head cold to go along with my other ailments. I’ll talk more about the campground later but when we got up Thursday morning, this is what we found. Sure made our decision to come here a day early look brilliant. The coach has been in the snow before but never with us camped inside. Sunday was just a normal day at home - cleaning, laundry, juicing lemons, peeling grapefruit, etc. 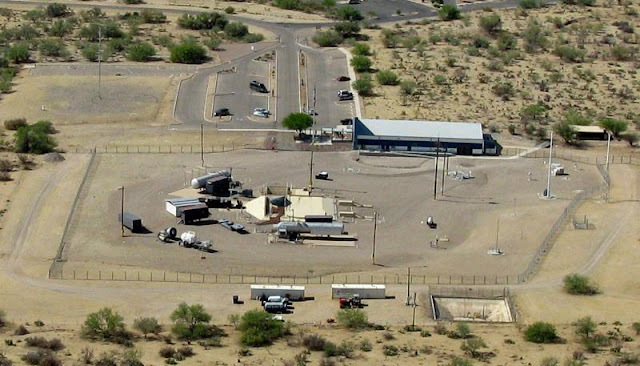 People in most areas of the country hear some about the border wall and most likely have an opinion about it, but when you are staying in Tucson, it is a very hot topic with something about it on nearly every newscast. On Monday, I spent a lot of time researching our options for traveling north on Thursday should the predicted snow occur that morning. Then we headed south a few miles to visit the Titan Missile Museum and so did many others as there was a 1½ hour wait to go down into the silo. Since Pat had already decided not to take the tour and I was concerned about the 55 step narrow staircase on a hip that was having a bad day, we decided to just look around the above ground area where they had a missile nose cone and a thermonuclear warhead shell on display. After yesterdays Biosphere II drive and tour, we had decided not to do much but clean up a little and fix supper but would you believe the girls just had to go back to a gem show for one last visit (their 4th) – is closes on Sunday and I guess they couldn’t stand the possibility of missing out on a bargain (prices were marked down 30% during their last visit). Bev had been craving pasta with meat balls but we didn’t want to make them so I went on line to see what I could find. 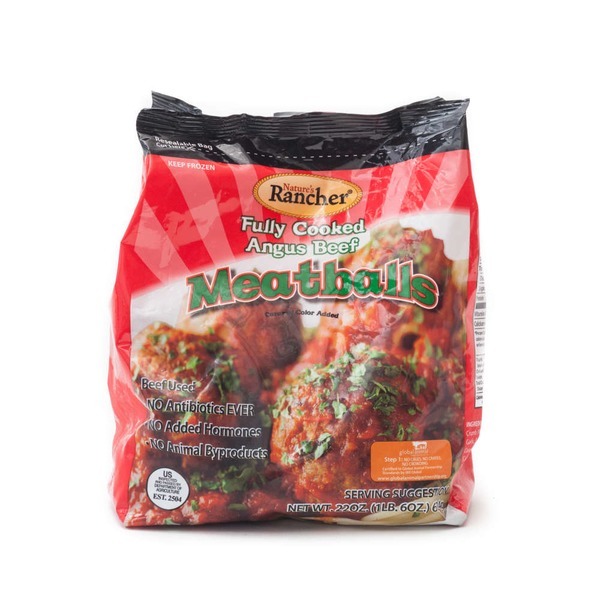 On a "Taste Of Home" site, I discovered their ratings for frozen meatballs and their top choice was Natures Rancher available at Whole Foods which we just happened to pass on our way home from Biosphere II – so we picked up a couple of bags. On Wednesday, I hung around the coach while it and the car got washed and waxed by a local crew and the girls made a third trip to the Kino Gem Show but this time they came home with wood tables and lamps purchased from a guy from Estes Park, CO – I had to make two trips to get all of the stuff plus the girls back home and not sure where we will put it while traveling. On Sunday we didn’t do much of anything but relax around the coach but we do have a temperature problem in the coach. While I was comfortable in my shorts and T-shirt, Bev looked like this. Do you pay attention to drug ads on TV – us old people generally do and as I watch them, I can’t help but wonder “How do they come up with these names?” Orillissa, Trelegy, Chantix, Epclusa, Taltz, Xeljanz, Jardiance, Vraylar, Stelara, Zicam, Brilnta, Dupixent, Cosentyx, Neulasta, Glucerna, Emgality - they like to use X and Z. Then here are a few of the largest sellers - Harvoni, Mabthera, Avastin, Herceptin, Sovaldi. And the generic names are even worse. This is what happens when you sit around the RV with nothing else to do. The temps were a little below freezing when I got up and the predicted cool temps scared us off of our planned trip to Tubac to attend the Arts Festival and the closed road due to snow cancelled my backup plan of driving up to Mt. Lemmon. So it was on to plan C with a drive thru the Saguaro NP and late lunch at Inca’s Peruvian Restaurant. 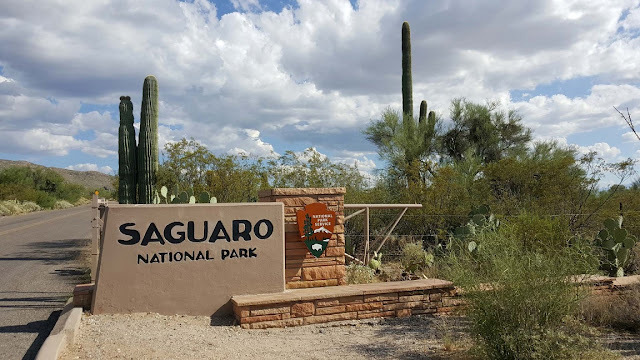 The Saguaro NP has a west and east portion and we chose the east because it was closer and had an eight mile loop road that was paved – I love using my Senior Pass to get in. We stopped at the Visitors Center and snapped a few shots – the Saguero with Bev is 102 years old and they had a labeled version of each of the desert plants around the center. 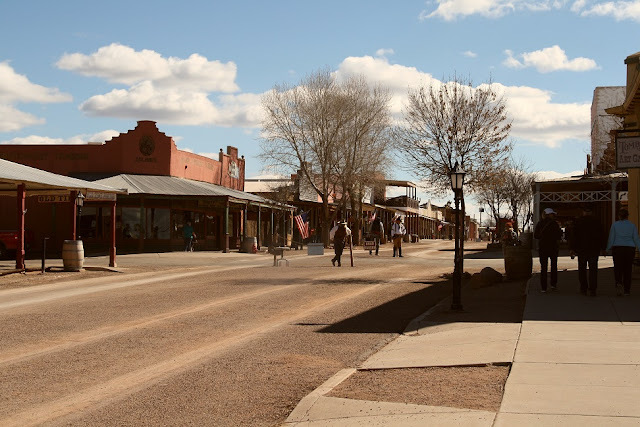 On Monday, we decided we would check out the local Indian Reservation which included a drive by their Desert Diamond Casino then the Mission San Xavier (Catholic Church) and then about 60 miles down to Sells, AZ which is a main town for the Tohono O’odham Nation. 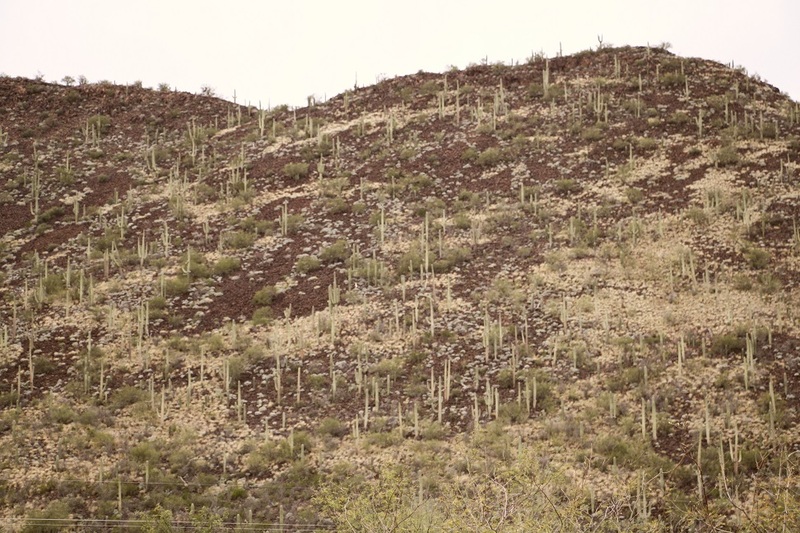 We were in search of their Heritage Center but after going to Sells then on to Topawa we never did find it, but we got some great views but few shots of the desert and mountains under cloudy skies. One of the nice things about being in a location for 3+ weeks is that you don’t have to cram something into every day so Saturday was a little more relaxing. 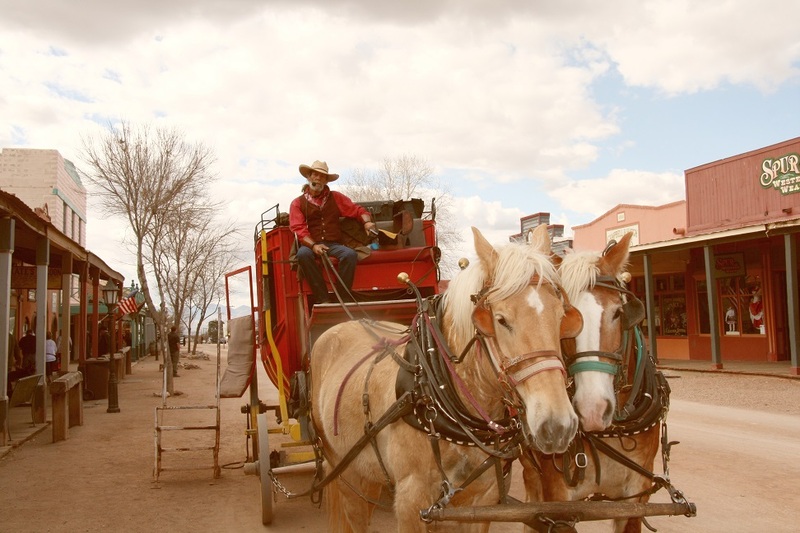 I put a chuck roast into our crock pot to have some meat in the fridge and puttered around the coach while the girls went to the on-site gem show – a major gem show is beginning in Tucson this week. In early afternoon, we decided to go checkout the meat counter at Sonora Meat Market which was a very unique place as it is a convenience store that sells their on-site butchered meat, liquor, and about everything in between. With narrow aisle and tall shelves, I don't believe another item could be crammed into the place. About all we did on Thursday was run a few errands and go to lunch at Aqui Con El Nene which had been recommended to us. Pat and I had a Sonoran Hot Dog and Bev and I had a Taco Taqui so I got to eat both of the recommendations from our friend Lea Ann. It's basically fast Mexican food where you order at the counter and they bring the food to you. 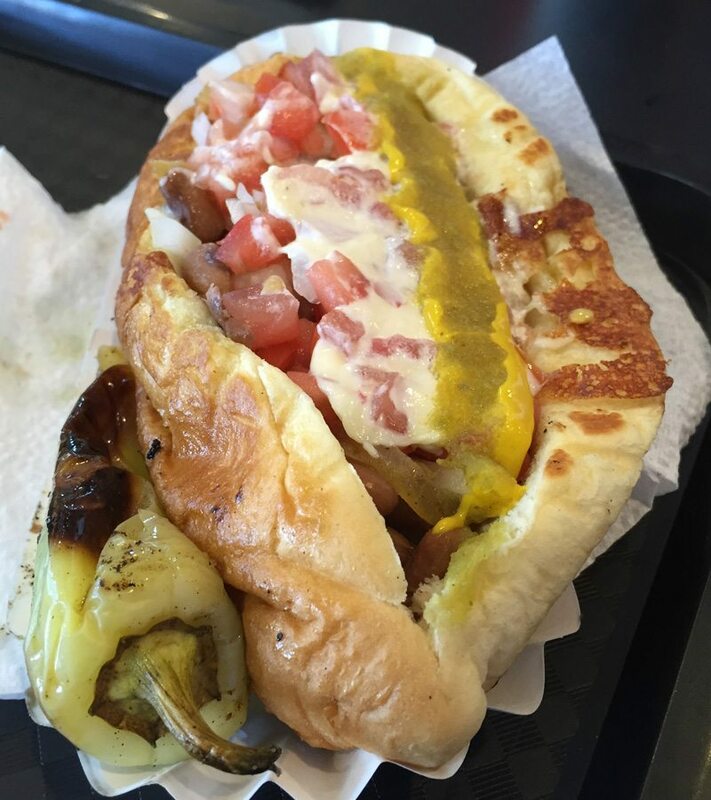 The hot dog is a bacon wrapped wiener topped with mustard, mayo and a variety of other items and the Taco is two tortillas wrapped around a green chile stuffed with meat, cheese, bacon, and mushrooms. I enjoyed both items but as is often the case in Mexican restaurants the meat was over cooked for my taste. They also had a salsa bar with about anything you would want for a topping. 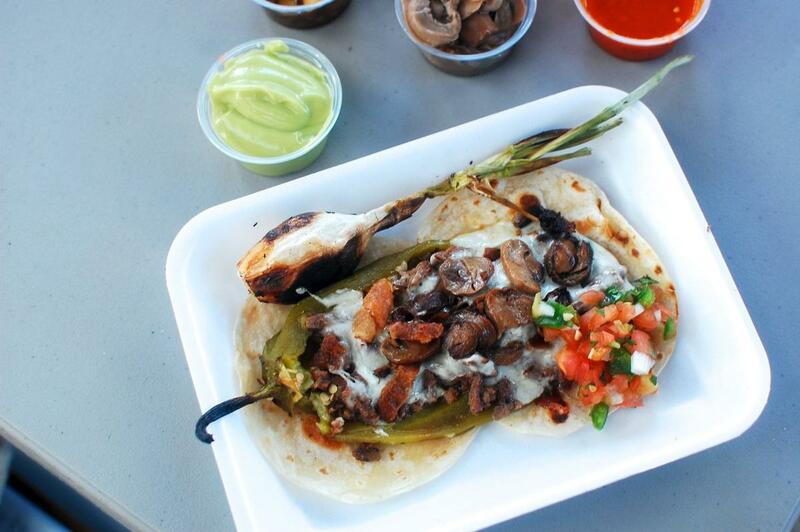 I look forward to trying more Mexican and Southwestern meals. 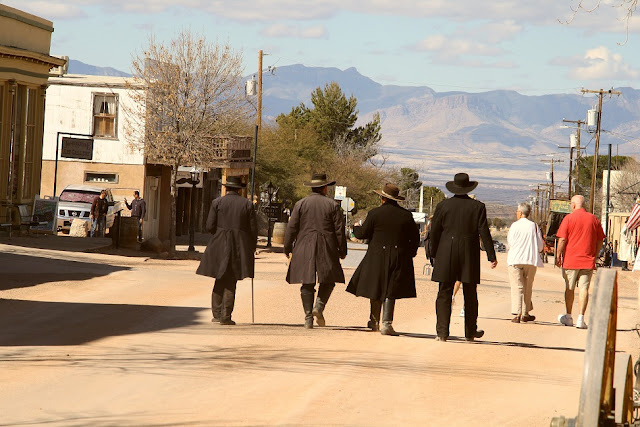 On Friday, we made the hours drive town to Tombstone for a look at one of Arizona’s most famous towns and while all but two of the original buildings have been destroyed by fires, it has been rebuilt to resemble the original – they even have gravel atop the paved main street. This is the Earp's and Doc Holliday walking down to the OK Corral for their famous gunfight - Doc is on the left with his cane and Virgil, on the right even walked with the necessary limp. We began our visit by taking a narrated stagecoach ride around town and learned some interesting town history but the main thing I learned was that I would not want to ride very far in a stagecoach. 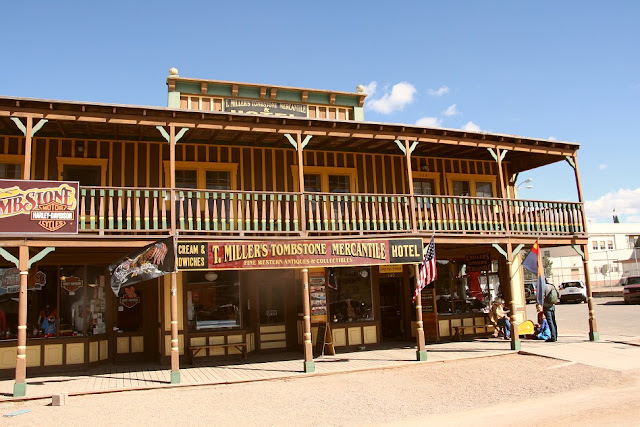 After the ride and getting to see most of the town, it was time for our usual - the girls went shopping and I headed for Big Nose Kate's Saloon, where I had a great time thanks to some semi-locals (from Sierra Vista) sitting beside me at the bar. When Steve, the owner stopped by for a chat, he insisted on taking some shots of us. Turns out, Steve came to the area from the Bronx, NY with virtually nothing and now owns Big Nose Kate’s, the Long Branch Saloon, and The Harley store. 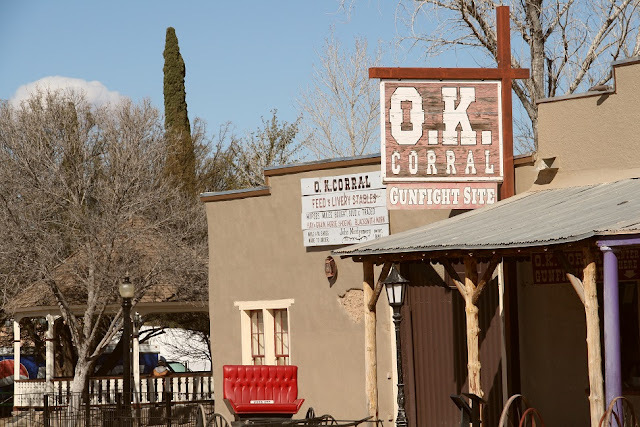 In case you haven’t seen the Wyatt Earp movies, Big Nosed Kate was Doc Holliday’s girlfriend and there was not a saloon with her name in the old days. They had a lady playing some playing and singing some very good music that I really enjoyed. When the girls got there, we had a good lunch but forgot to take food photos - here is a menu link. The servers dress in period costumes. I had the Outlaw Burger, Bev had the Dutch Annie’s Mixed Meat Calzone, and Pat had Goldie’s Famous Over Stuffed Reuben. We all enjoyed our meals especially the Reuben which I would expect from a Bronx native. They like to take shots of their customers in period costumes. 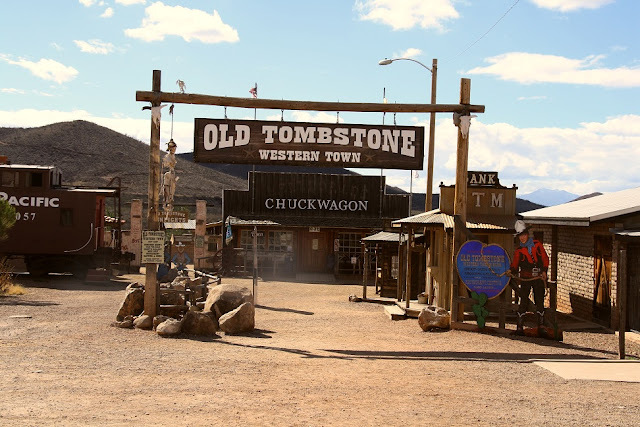 We really enjoyed Tombstone, even though everything is set up to capture the tourists dollars (even the OK Corral has walls around it) we will try to get back again. 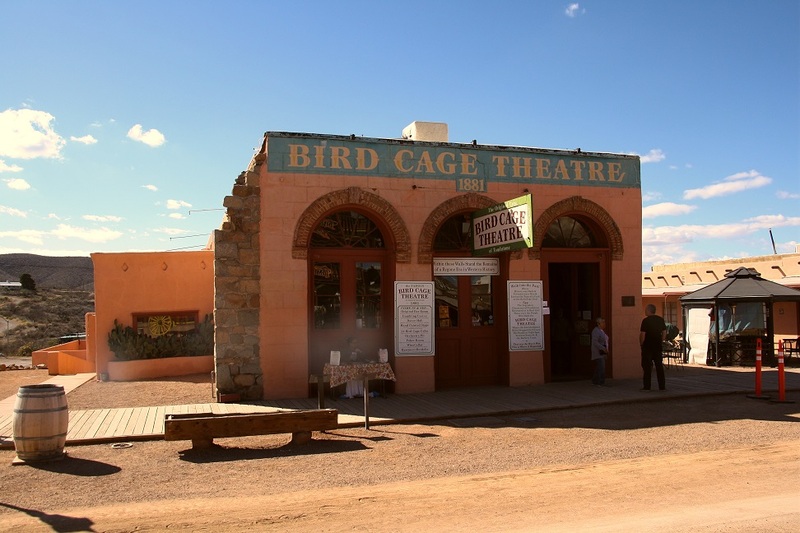 Since we were in the area, we decided to drive further south and check out Bisbee then over to Sierra Vista. 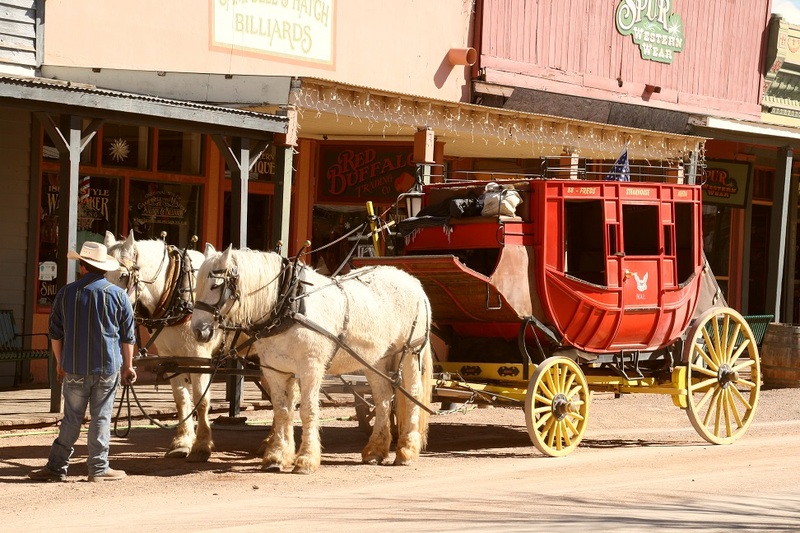 Bisbee is an old mining and now tourist town to which the girls want to return and Sierra Vista is just a regular town with an army post – Fort Huachuca. Since it’s just an hours drive, we will want to go back to Tombstone at least one more time. Photos can be enlarged by clicking on them and the blue words are links. Have a great day and thanks for stopping by Almost Heaven South. 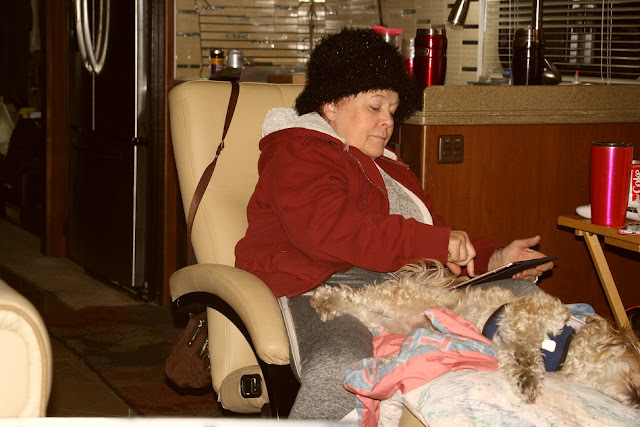 We spent our first full day getting to know some of our neighbors which is my favorite part of RVing. One of the couples right beside us are full timers and we enjoyed spending a couple of hours chatting with them but unfortunately they were leaving the next day. Then, while walking the dogs, Bev ran into a guy a few sites down who invited us down to watch the TN basketball game, which we did of course. Turns out his fiancee is from Knoxville and he is from Cleveland, TN (we live between the two) and they are both contract nurses. They have been here for a few years and live in the campground full time as it’s cheaper than renting an apartment. This couple plus their neighbors make up a little community that operates like a family ranging in ages from 29 to around our age – I look forward to spending more time with them. On Sunday with nothing else on the agenda, we decided to drive up to Hatch, NM so Pat could say she had been to the Chile Capital Of The World, however, after driving up one side of the river on a state road then back on I-25, it may be more accurate to call it the Pecan Capital Of The World as giant orchards lined the valley floor on both sides of the io Grande river – I read an article that said they now grow about half of the chiles that they did about 13 years ago. The Rio Grande, a pecan orchard, and fields ready for chiles. 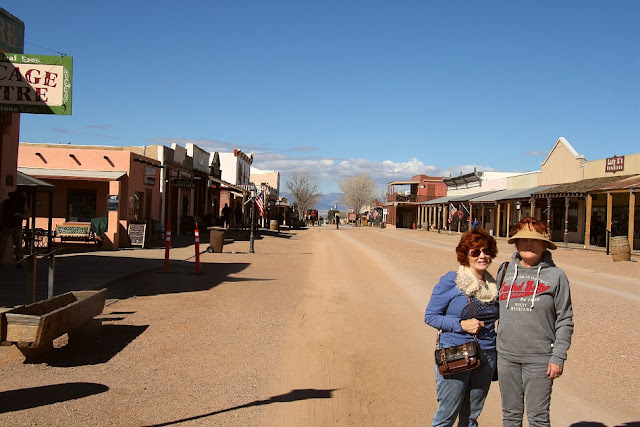 For our first big day in Las Cruces, we went to Walmart for a few supplies, drove through the old town of Mesilla and went to downtown Las Cruces to check out the farmers market location. Then we rested up as a day of driving and riding takes its toll on us old folks, especially the driver. On Saturday, we awoke to our second morning of freezing temps requiring disconnecting the water – I had always heard that it gets pretty cold in the desert at night then warms up quickly, which it did yesterday and even when the thermometer said it was cold, it still felt warm in the sun. The girls got up earlier than usual, and we headed downtown for the farmers market but stopped off at the Santa Fe Grill for a recommended Green Chile Burrito. We knew it was in a gas station but didn’t realize there wasn’t actually a restaurant but a window where you ordered and it had only had one set of seats - so it was basically a place to get to-go food. States in which we've spent at least one night. A relaxing, sunny, warm spring day. WHERE ARE THE DIXONS TODAY? I call these Spicy Italian Smashburgers..